What does OptiCut's cutting optimisation look like? OptiCut is a cutting optimisation software package. Once you've designed your project and created a cut list, OptiCut will take this cut list and tell you the best way to cut it from a panel material to save time and minimise waste. This means you'll start saving money immediately and over time make very big savings. As well as wood, OptiCut can be used for any other sheet material like glass or metal. It also optimises bars and profiles like aluminium window frames. The optimisation is output as a cutting map showing the position of the cuts you need to make on the panel, and the sequence in which to do it. This map is all you need to run a panel, beam or other manual saw. The cutting optimisation also comes with labelling to identify the part, indicate edging and the file reference for a CNC machine. The file reference and other data can be printed as a bar code to load the correct machining file on the CNC machine automatically using a bar code reader. 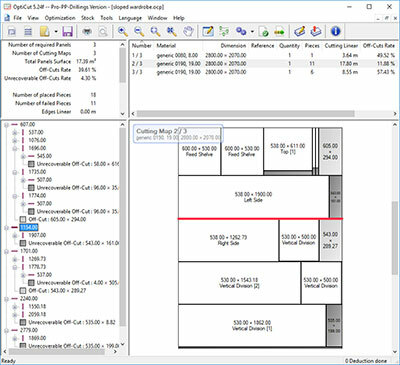 OptiCut also produces a report showing the percentage of off cuts with costs analysis, and stock management features include reintegration of reusable off cuts to your panel stock. If you have a CNC saw, OptiCut Pro PP comes with a large range of post processors to output the code the saw needs to run the cutting sequence automatically. These brand specific post processors can be configured to match your particular production methods. 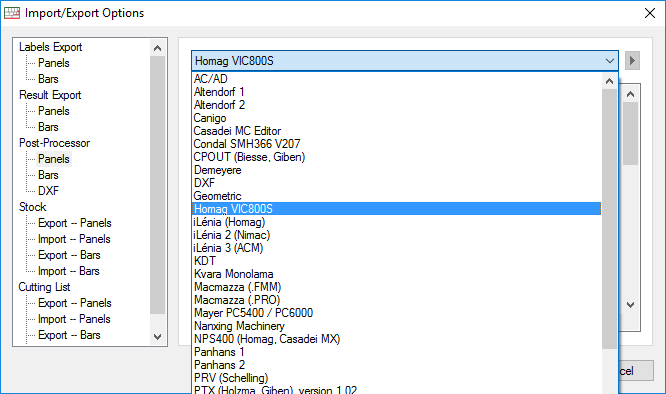 Cannot find your CNC saw on this list? Don't worry, we are creating new post processors all the time. Contact us if you'd like to discuss the possibility of setting up a post processor for you. Please also note that some saws do not offer full CNC automation but can accept the output as a spreadsheet. Haffner Murat saws are one example of this set up. Where this is the case, OptiCut can generate the optimisation results as a spreadsheet to load into the saw. You can manually input the cut list but OptiCut also offers a configurable automatic spreadsheet import. 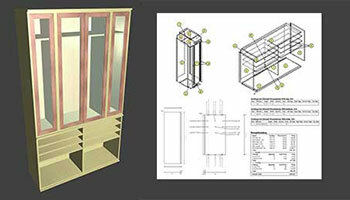 We also have a seamless integration with our furniture design software Polyboard. The fastest way to design and manufacture your projects...click of a button output of the cut list from Polyboard into OptiCut, watch this video for details. 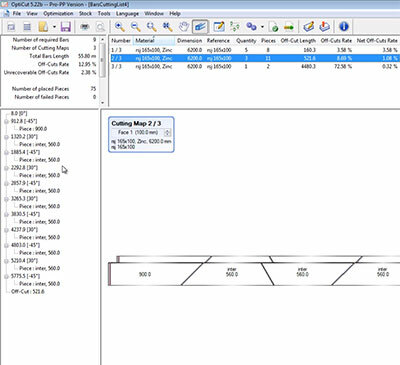 If you are using any type of saw to cut your panel materials, there are major benefits to be had from using a cutting optimisation software. If you have a point to point CNC that machines each part in turn, you will still need a saw to cut the parts beforehand and ideally you should be optimising the cut list as part of your workflow. If however you are using or planning to use a nesting CNC, you do not need to cut out your parts first. The CNC will cut the parts and machine them. You will however need to nest the parts on the panel that goes directly on the CNC. Some CAM software packages offer basic or advanced nesting. We can advise you on some good CAM packages that do this. Alternatively, you can add a nesting optimisation software to your workflow like our OptiNest solution. We have more details here on the differences between point to point and nesting. You can download our trial version of OptiCut and create an optimised cutting map, but it won't include all the details to allow you to cut the parts. Below you can download a sample optimisation in full. 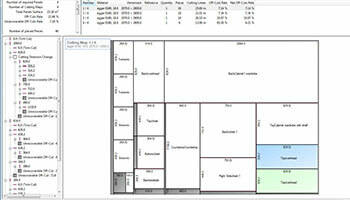 We've included a cutting map for both panel and profile/bar optimisations, along with part by part labels. 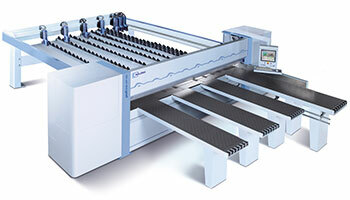 We cannot include the post processor files for every CNC saw here, so please contact us with details of your saw and we'll send you the files if you wish to run a test. Please consider a complementary screen sharing session with us if you would like to confirm the compatibility of a CNC saw with OptiCut. We can also create a new post processor for you if required.